Thanks for sharing it. This story shows how Radhanath Swami saves his disciples from being contaminated by envy, jealousy and other vices. Thank you for sharing such an important experience with Radhanath Swami Maharaj which teaches us how we should not criticize others ! Great lesson taught in a unique style. Maharaj teaches us such wonderful lessons with his own wonderful example! Thanks for sharing. This is one of the very important instructions of Radhanath Maharaj, thank you very much for sharing it. That is the highest standard of HH Radhanath Swami. Thank you for sharing the heart of HH Radhanath Swami. Great lesson to learn from these incident. There is no place for criticism in devotional service. 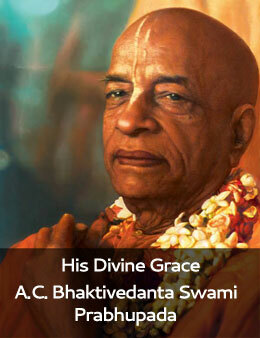 All glories to HH Radhanatha Swami Maharaja. A valuable lesson to learn. very wonderful lesson. Thank you for sharing your experience. This is one of the great virtue of Radhanath swami not liking to criticize any one for any reason. A great lesson to learn for everybody. Hare Krishna. Pure hearted souls like Radhanath Swami can not tolerate criticisms about others even if such statements are true. Personalities like them can really teach the society on how to progress on path of devotion by their personal standards. Thank you for sharing this superb incident which so amazingly illustrates the attitude that Radhanath Swami implicitly wants from his followers. Thank you so much for this enlightening narration. An inspiring message. Thank you. A beautiful lesson to learn. Thank you very much.Very good lesson learned from story.It is very important to not criticize any one and I simply want to give up habit. Very inspiring teaching by HH RNS Maharaj. Thanks for sharing this. Thanks for sharing. It is natural for a pure soul like Maharaj not to tolerate criticisms of others. We have a lot to learn from this one simple experience. Thank you for sharing. So much to learn from swami ji.